Here are some photos of Br Tyler Tracey's entrance into the Novitiate of the Fraternity of St Philip Neri at the Basilica of Ss Peter and Paul, Lewiston, Maine. 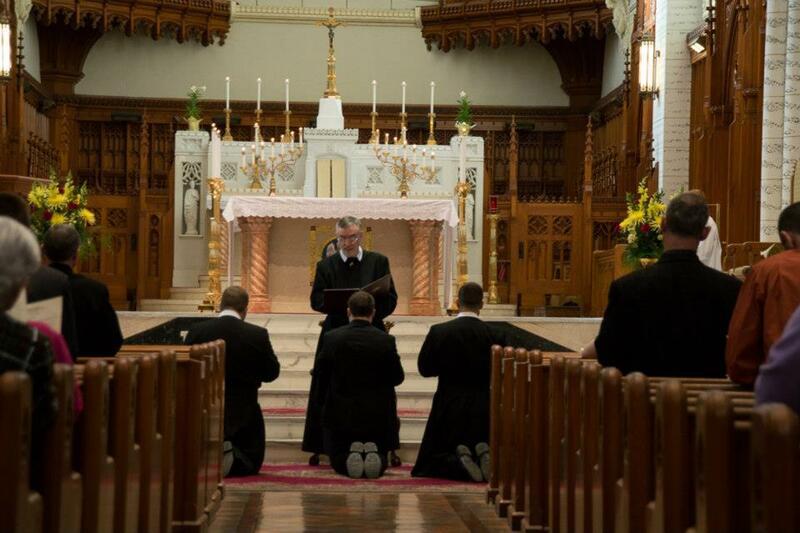 This is an Oratory in Formation founded just last August and Br Tyler is their first novice. So it is a young community just beginning to establish itself and making a great start. There are three priests. 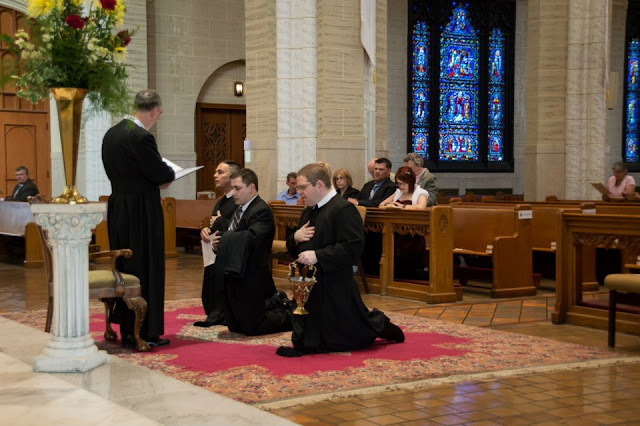 I attended the ceremony which was last Friday afternoon and which was followed by Vespers and Benediction. 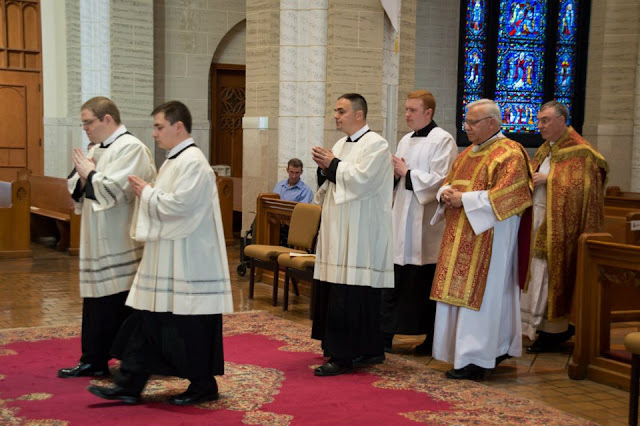 I was especially glad to be able to make it as Br Tyler is a former student of Thomas More College of Liberal Arts and I know him well. 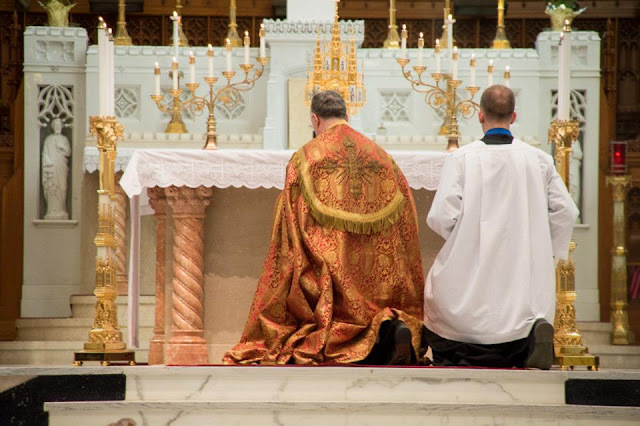 I have additional personal reasons for wanting to support this new community and that is that my experiences of the liturgy of the London Oratory was so influential in my conversion and my continued contact with the London Oratory and with the Birmingham Oratory has been so nourishing for my faith. Both are churches where the liturgy reduced me to tears...for the right reasons! 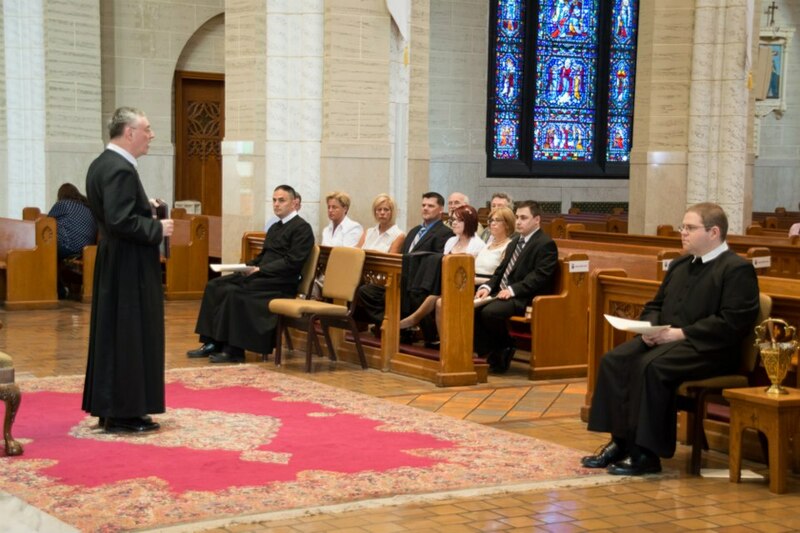 Mgr Caron, the superior of the community described proceedings as follows: 'On Friday, May 3, at the Basilica of Saints Peter and Paul in Lewiston, Bro. 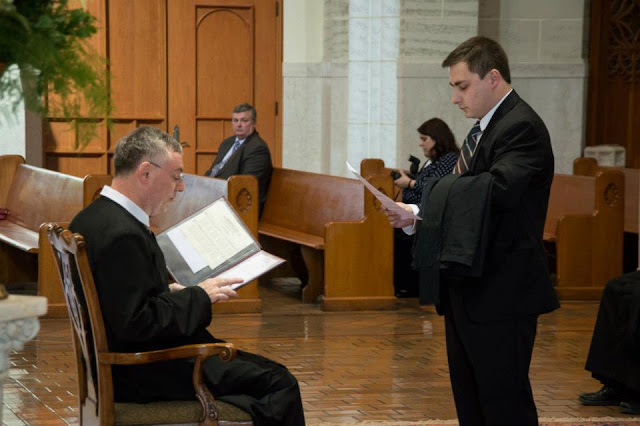 Tyler Tracey was admitted as a member of the Fraternity of St. Philip Neri for the probationary period of one year in the course of a rite which was taken in part from the one prepared by Blessed John Henry Newman for the Birmingham Oratory. It begins with singing the hymn to the Holy Spirit, Veni Creator. The postulant is questioned as to his desire to live according to the Oratorian charism, and all pray for him using the Litany of St. Philip, composed by Blessed JH Newman. After publicly stating his intention to life according to the statutes of the Fraternity for the coming year, he is given the habit of the community. 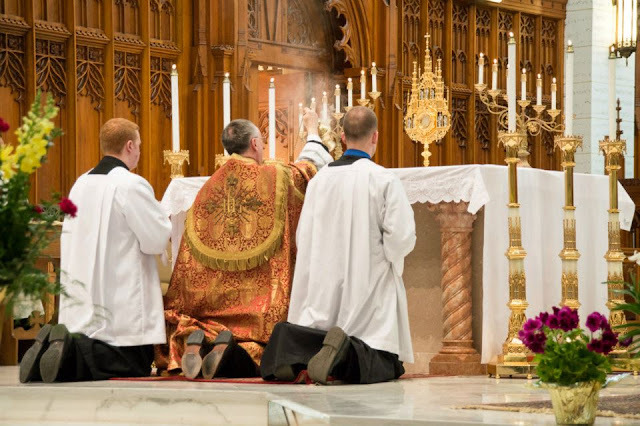 Each member of the community offers him a fraternal sign of peace, and all venerate the relic of our holy father St. Philip. Congratulations to all! My prayers are with you. Above: people starting to gather in the church early (yours truly closest to us on the rhs). 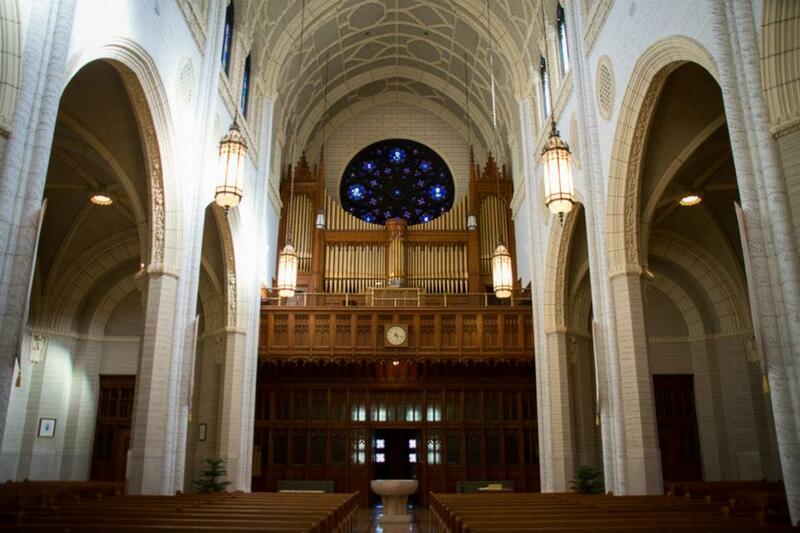 The basilica was completed in the 1930s inspired by the French gothic. 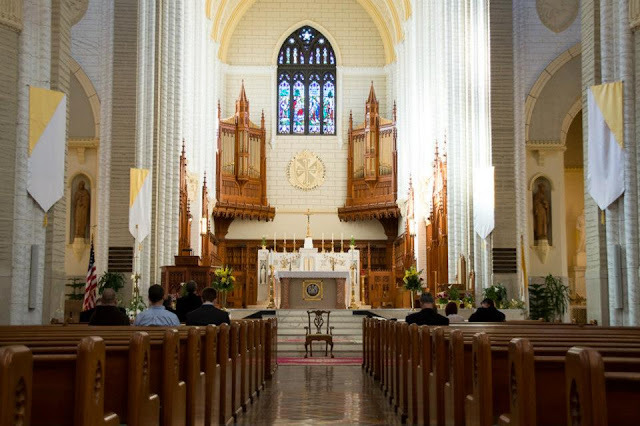 There is extensive and beautiful woodwork throughout the church. If I turned around from my position in the pew, the photo below shows the sight I would see.